Feniks, a chair with starlike airs: a team player, attuned to any individual situation, dynamic, pure and functional. This characterizes all the models of the Feniks family, making them harmoniously usable on numerous occasions. Feniks fits in always, everywhere and naturally in any conceivable combination. Feniks II: The Feniks cantilever chair is springy in a particularly comfortable way. 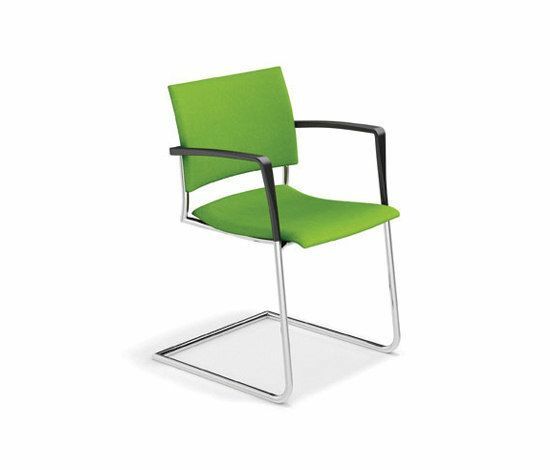 Thanks to its slender tubes the chair remains graceful, and what’s more, it retains its trendy look. The shape of its frame prevents the chair from toppling backwards and keeps its back from damaging the wall while you are reclining. Feniks XL: Feniks XL is the chair among chairs. Its seat is wider and dee-per compared to the standard version. Its back is more gene-rous. The De Luxe upholstery of seat and back is even richer and thicker. For all occasions when people want to sit long and comfortably. Feniks Barstool: Each Feniks chair contributes conviviality. Every meeting or speech comes to an end, the point in time for which the designers developed an independent barstool as an extra. Executed from low to high, they are an invitation to table, counter or bar. Feniks Traverse: Feniks traverse sofas can be linked by means of a coup-ling leg. Besides, the legs see to it that the back remains free from the wall. An angular set-up, with table top, is one of the standard options as well.